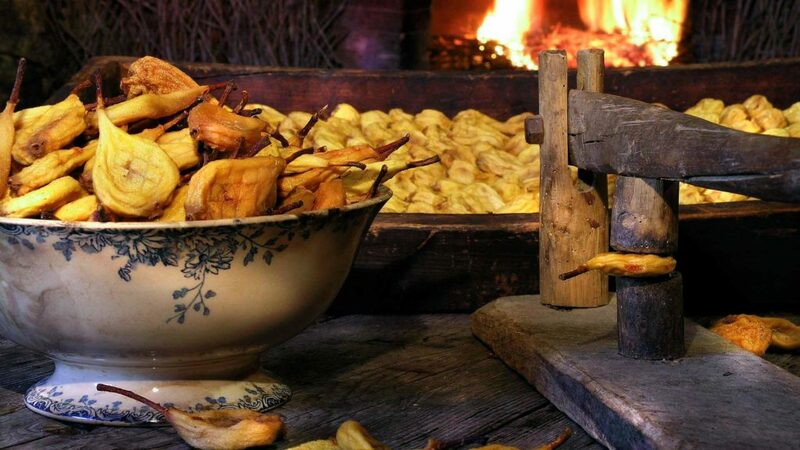 ‘Poires tapées’ is a dried pear recipe that goes way back! Using a preservation method dating back to the 11th century, foodies come from far and wide to sample this sweet Touraine speciality in the village of Rivarennes, near Azay-le-Rideau. After the crusades, peasants learnt how to preserve fruit by drying them. They started with plums (upon her return to Fontevraud, Eleanor of Aquitaine encouraged plum trees from Damascus to be planted in the Loire Valley), then used the same technique on local fruit: apples and pears! In the 19th century, farmers had to destroy vines afflicted by phylloxera, so they were glad that they could count on these popular dried fruits, which were sold in shops and exported to Northern Europe. Although trade stalled between the World Wars, pear trees have stood the test of time, firmly rooted in the rocky slopes around Rivarennes, near Azay-le-Rideau. It turned out very well as since 1987, enthusiasts have been carrying on the tradition! “Pouères” (pears in old Touraine dialect) are peeled, placed stalk down in racks and then spend several days in wood-fired ovens. Once they’ve dried out, the pears are flattened out using a specific tool, the “platissoire” (to speed up dehydration) and placed in a warm room before being packaged. Nowadays they are eaten rehydrated, soaked in Loire wine, Hypocras (wine with honey and spices), eau-de-vie or cooked in a sugar and cinnamon syrup… Simply delicious as a starter or dessert! A recipe for poires tapées? No, several in fact! Find them in the guide provided by the Poire Tapée Museum. Les Reines de Touraine (Philippe and Christine Blot). You can also find this sweet speciality in gourmet food shops around Touraine in the Loire Valley (Tours, Amboise, Azay-le-Rideau, Langeais, Loches, Bléré, Villandry, etc. ).